I just got a craving for pancakes after seeing lots of mouthwatering pancake stacks on instagram and I was glad to have some leftover banana pancakes from a few month ago. 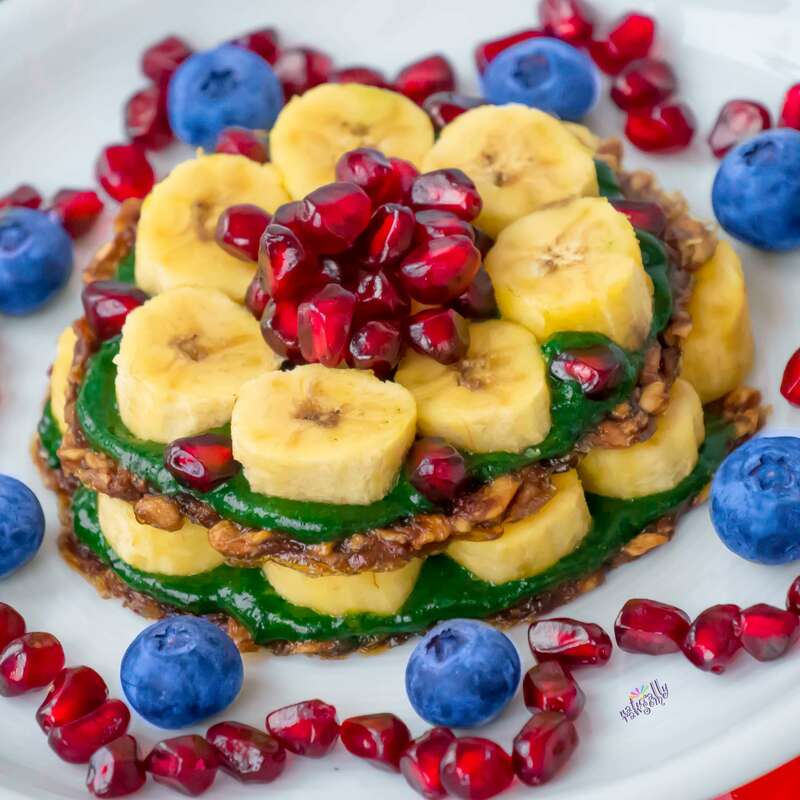 Yes, the advantage of raw pancakes is that they can be kept quite a while and are ready to eat whenever cravings click in. And to make them super healthy I added my favorite green juice powder and made a really delicious, protein and mineral rich spread. This breakfast sure was a heavenly indulgence and I can’t wait to make it again. For the raw pancakes peel 4-5 medium sized bananas and finely chop them. Stopp chopping before they turn into mash. Now spread about 2 tablespoons of the chopped bananas on a parchment paper (on a dehydrator sheet) and form a nice round pancake. Repeat until all of the chopped bananas are used up. Dehydrate them for 12-16 hours at 104°F/40°C. You know that they’re ready when you can easily peel them off the parchment paper. For the protein filling blend up 1/2 of a mango with 1-2 tbsp of barley grass juice powder. Slice up the baby bananas. 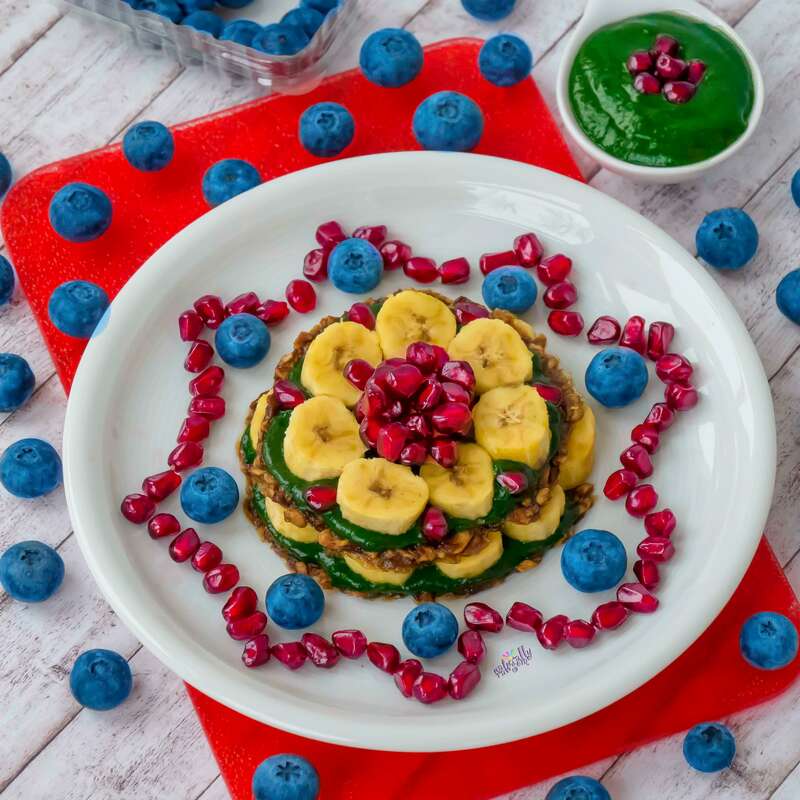 Place a pancake on the plate spread it with the protein dip, place some banana slices on it and top it with another pancake. Repeat! Decorate your plate with pomegranate seeds and berries and get your fork or spoon ready!